THE SOFTWARE ("MIDAS") IS PROVIDED "AS IS" WITHOUT WARRANTY OF ANY KIND, EITHER EXPRESS OR IMPLIED, INCLUDING, BUT NOT LIMITED TO WARRANTIES OF MERCHANTABILITY OR FITNESS FOR A PARTICULAR PURPOSE. IN NO EVENT WILL THE AUTHOR BE LIABLE TO YOU FOR INDIRECT, SPECIAL, OR CONSEQUENTIAL DAMAGES, ARISING OUT OF ANY USE THEREOF OR BREACH OF ANY WARRANTY, EVEN IF ADVISED OF THE POSSIBILITY OF SUCH DAMAGES. ONCE LICENSED, ANY UNAUTHORIZED DISTRIBUTION OF YOUR UNIQUE MIDAS ID (PRODUCT KEY), OR FILES CONTAINED WITHIN THE SOFTWARE, WILL IMMEDIATELY INVALIDATE YOUR LICENSE AND NO PRODUCT SUPPORT OR UPDATES WILL BE GIVEN. ILLEGALLY DISTRIBUTING A MIDAS ID, OR FILES CONTAINED WITHIN THE SOFTWARE, WILL ALSO BRING ABOUT CRIMINAL CHARGES TO THE FULLEST EXTENT OF THE LAW. DISTRIBUTION OF LICENSES IS AT THE SOLE DISCRETION OF THE COPYRIGHT HOLDER AND MAY BE REVOKED AT ANY TIME FOR BREACH OF LICENSING TERMS OR AGREEMENT. You may install a single "live" instance of this software on one server only. We also permit you to install a second, separate, "not live" instance for testing purposes only. With the exception of the "Language Packs" (contained in the "language" folder), "Theme Packs" (contained in the "themes" folder), or settings files, you may NOT modify any other files, whether complete, or in part, within the software for any purposes, including your own private or commercial purposes. Custom text added to "Templates" may not be contradictory to the terms set out in this License Agreement. You may NOT decompile, extract, reverse engineer, rebrand, disassemble or otherwise reduce the software to a human perceivable form. You may not resell or create derivative works based upon the software. All software code is © Copyright 2005-2019, except where indicated. You may NOT extract and use any portion of the copyrighted code for your own private or commercial purposes. We may not be held responsible in the event of any losses, including data or financial losses, arising out of the use of the software, howsoever caused. By installing MIDAS on your server you acknowledge that you have read this license, understand it and agree to be bound by its terms as the complete and exclusive statement of the agreement between us, superseding any proposal or prior agreement, oral or written, and any other communications between us relating to the subject matter of this license. 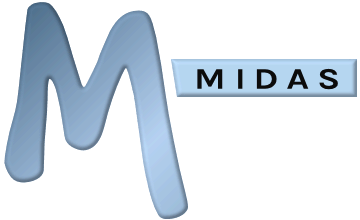 Can I install a self-hosted MIDAS system in both my production and test environments?